Although AT&T has fiercely fought the Federal Communications Commission's net-neutrality rules, it's backing Wednesday's "day of action" denouncing AT&T and other ISPs. Of course, AT&T doesn't actually agree with the aim of the protest—to support the 2015 regulation that the FCC wants to overturn now that Republicans are in charge. AT&T says it supports an "open internet" and believes companies shouldn't block web content or slow down videos from other providers. Rather, AT&T says it merely opposes the FCC rules that set it in place. Comcast and Verizon joined AT&T in making that distinction. ISPs don't like the FCC's approach because it treats internet service as a utility and comes with more oversight. They worry about price regulation and say the rules hurt broadband investment. Tim Karr, the campaign director for Free Press, an advocacy group that supports net neutrality, slammed the ISPs for "simply attempting to fake the funk, pretending to support net neutrality while opposing the (FCC) rules that make it an enforceable reality." The 2015 regulation is the only set of net-neutrality rules that courts have upheld. Internet activists and tech firms hope that the protest will pressure Congress and the FCC, the way a highly visible 2012 online protest—including the blackout of Wikipedia's English-language site for 24 hours—helped kill anti-piracy legislation that tech companies equated to internet censorship. This year's online protest is more muted. Netflix put a gray banner at the top of its home page and is tweeting out "gif" animations in support. Amazon's website has a small square inviting users to "learn more." Twitter is promoting "net neutrality" as the top trending topic in the U.S. Google tweeted a blog post. Smaller tech companies including Airbnb and Etsy have fat banners on their home pages. Karr said that internet users have taken "hundreds of thousands of actions," like contacting the FCC. There had been about 6 million filings on net neutrality's overturn made to the FCC as of Tuesday night, both supporting and opposing the policy; that had risen to 6.7 million Wednesday afternoon. AT&T says it supports an "open internet" and believes companies shouldn't block web content or slow down videos from other providers. Yet they, and other ISPs engage in exactly that. They're using the rhetoric of "we're not picking content providers", while attempting to kick the legs off of competing network providers by hobbling the peering links between ISPs. 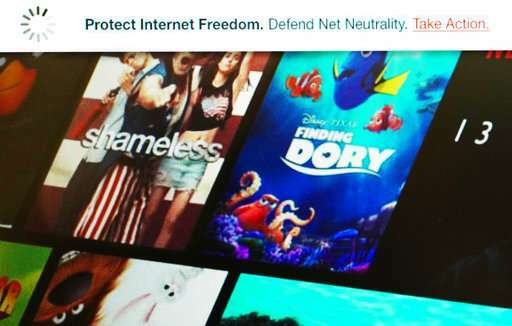 See Comcast-Netflix-Verizon case. The ISPs are trying to balkanize the internet. The idea is to make it more expensive for a content provider to provide content in multiple different networks, because inter-network access between ISPs is limited and subject to throttling (indiscriminately = "net neutral" according to the ISPs), so they would have to buy separate access to each ISP. The point is that content providers would not bother to spend money to connect with the smaller ISPs and instead concentrate just on the largest networks with the most customers, causing users to flock to these networks in turn. They worry about price regulation and say the rules hurt broadband investment. They're worried about price regulation because they are looking to jack up the prices with their de-facto monopolies over most of the country. By the mechanism described above, the ISPs make it difficult for any parallel competing network to exist since they would lack proper access to content and therefore to customers. It would be a case of, "I would buy Local ISP because the prices are good, but streaming video just works so much better on AT&T." And it would all be "net neutral" because AT&T is not throttling anything in specific - they would just be pricing their peering with Local ISP so high that there would be effectively no peering between them, so trying to watch Netflix from a server on AT&T's network on a Local ISP connection would automatically take the slow lane, since Netflix could not spend the money to have a redundant server in every Local ISPs network.